Hand, arm, neck, and upper back pain are common among desk workers. One of the most useful, yet easy strategies to minimize pain associated with desk work is stretching. In just a few minutes a day, you can do simple stretch activities that will help you work at your desk safely and comfortably. Select one or two activities at a time, and spread throughout your day. As an occupational therapist, I have had hundreds of clients referred to me for hand and arm pain. Most are referred for carpal tunnel syndrome. Few however actually have carpal tunnel! You might be shocked to know how many of these clients were “cured” with simple stretches and posture tips. By this I mean they got complete relief from their symptoms. My favorite stretches are chest openers. You can use corner walls or a doorway. 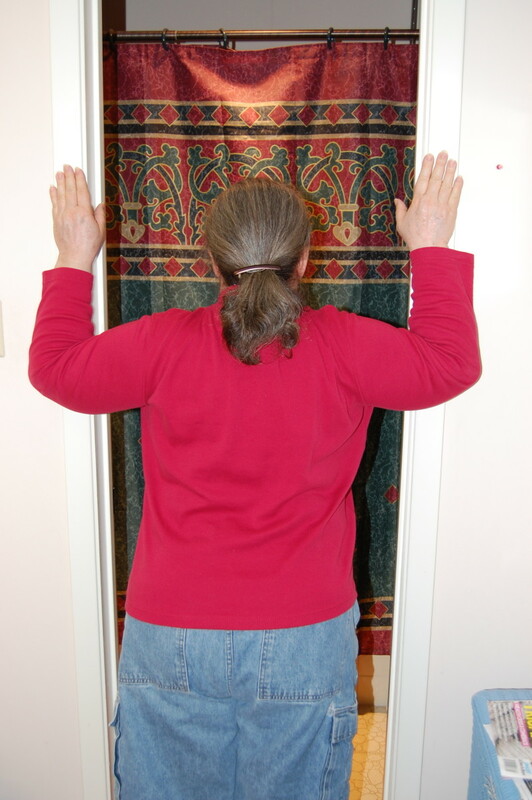 Step up to a doorway and place your hands on the door frame. 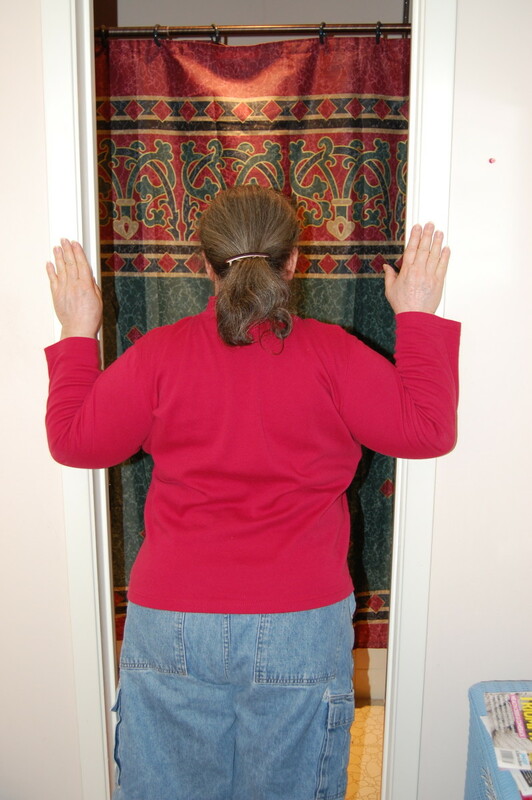 Lean into the door opening, with your head level, until you feel a slight pull in the muscles. 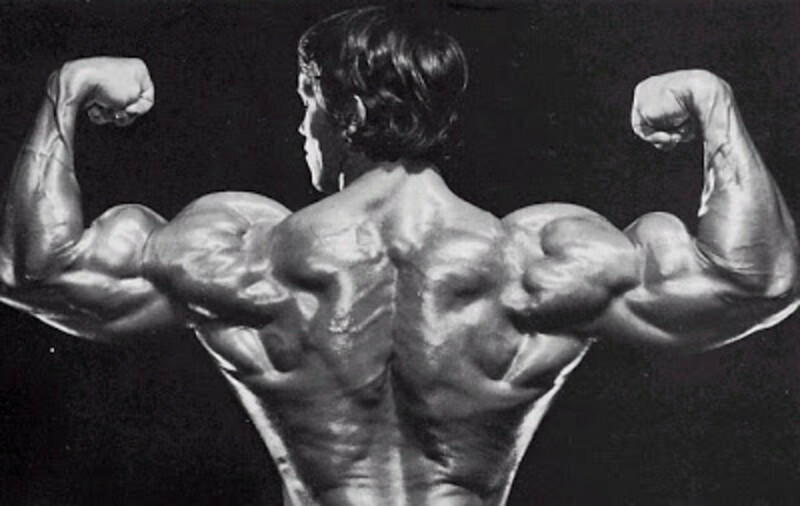 To work on all fibers of the pectoral muscles, perform with your elbows above your shoulders, even with your shoulders, and below your shoulders. An alternative method for chest openers is to perform them seated at your desk, by pinching shoulder blades together like a rowing action. You can do this with elbows bent, or arms straight and down by your sides. Keep your head straight and level. Stretch both sides at the same time, or alternate sides. To alternate sides, first turn your head to the left, while pressing right arm and shoulder backward. 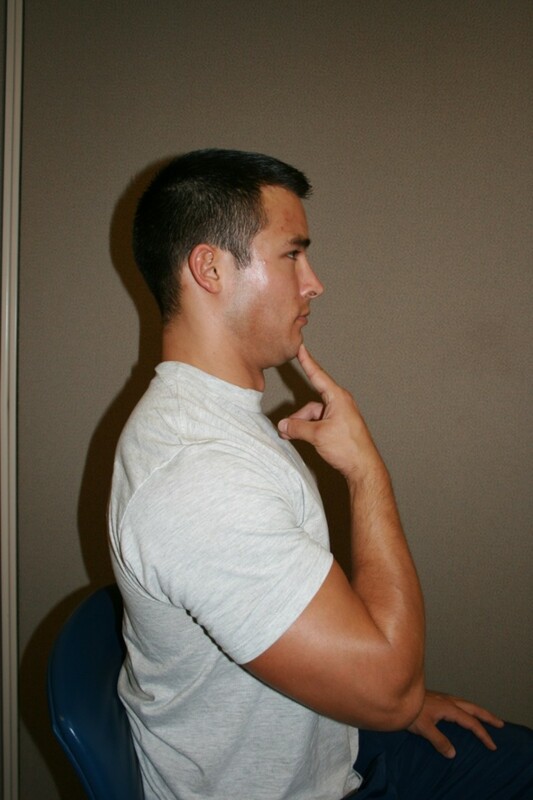 Alternate to stretch the left upper chest, turning your head to the right, and pressing left arm backward. A more common, and perhaps more familiar stretch, is the neck side bend. Start with your head tall and level, and facing forward. Slowly bend the head to one side. Hold for five to ten seconds with steady pressure. Relax for a few seconds and repeat. Perform about five times, returning your head to the middle each time. Repeat the process for the other side. Be sure that your shoulders remain pressed downward. This is good for the upper trapezius, among other muscles. The trapezius is very tight in many of us. 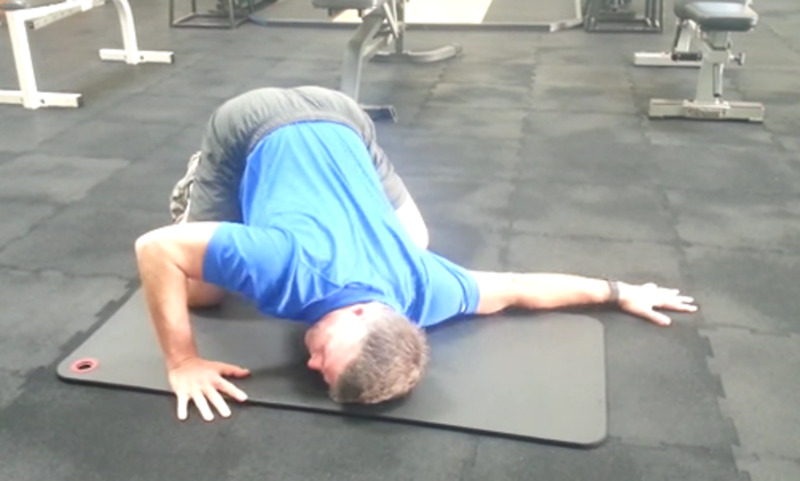 I find that many of my clients inadvertently raise the shoulder when doing this stretch. This is done unconsciously but does not allow a stretch. The levator scapulae may be a less familiar muscle, but it's a very important one. This muscle attaches to the upper, inner corner of the shoulder blade, and near the base of the skull. Many muscles attach to the shoulder girdle and base of the skull, but in my experience with clients, this muscle is particularly problematic. Most muscles shorten when they are called into action to contract. When we spend a lot of time looking down, the levator muscle is in a lengthened position, but still active and contracting. 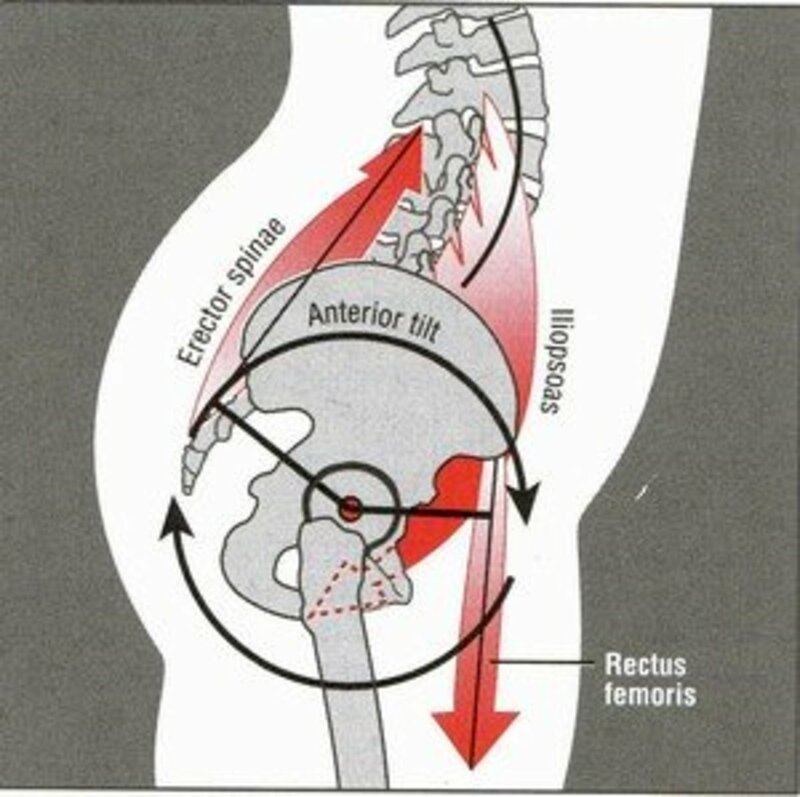 Extensive time spent looking down may cause muscular trigger points, and are common in the levator. These trigger points often refer pain distally to the elbow and hand. Aggravating activities include looking down reading or writing, looking down at a laptop, looking down doing craft activities, and looking down feeding a baby. To stretch the levator, point your nose to the opposite armpit. Pull your head gently toward your armpit using the hand from the same side. Perform several times, then alternate to the other side. Chin retractions stretch the muscles that attach to the shoulder girdle or upper spine to the base of the skull. Keeping your head tall and level, push your head backward. Many clients have told me they do this stretch when stuck in traffic. Push your head straight back, pressing into your car’s headrest. Alternatively, lay on your bed without a pillow, or on an exercise mat on the floor. Push your head down into the bed or mat. This activity is good for many of the muscles that move the arm at the shoulder joint, but also for the muscles that tether the shoulder blade to the spine. Hold your right arm straight out in front of you. Start moving your arm across your chest toward the left. 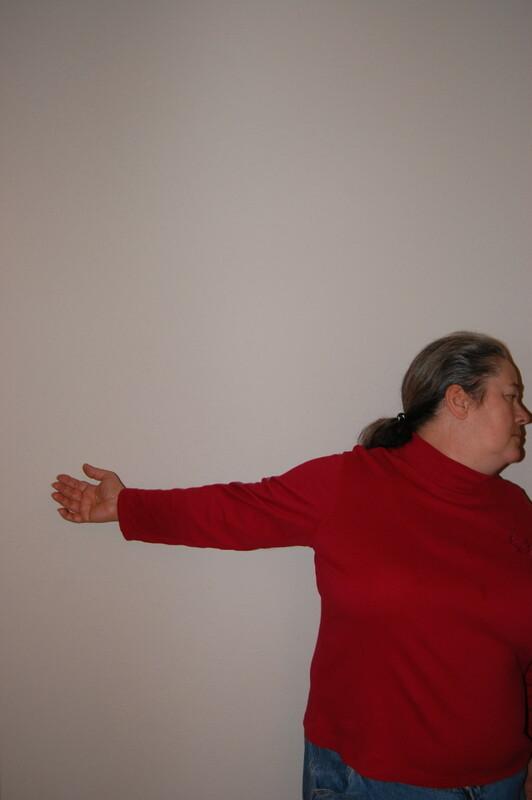 Gently pull your right arm toward your chest with your left hand at your right elbow. Hold a few seconds, then relax a few seconds. Perform about five times, then alternate with left-sided stretch. Start conservatively. Even though these are stretches and not exercises, it is possible to overdo it. These activities should not be painful. 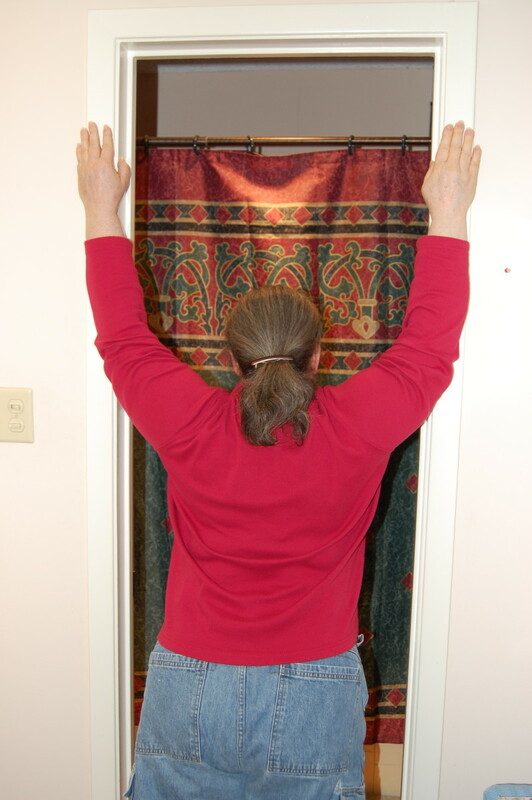 Perform each activity, pressing into the stretch until you feel a moderate pull. Do not bounce. Start with one or two of the activities, and do three to five repetitions, holding about five to eight seconds. Relax three to five seconds between repetitions. Build up to doing all of the presses, performing five to ten repetitions of each, holding about eight to twelve seconds. Make sure to do both sides. You may not be able to achieve the same amount of stretch on each side. For example, if you have had an injury, you may have less tolerance on that side. Performing these stretches while at your desk, spread throughout the day would be ideal, but you can do all the activities in one session, one or two times a day. Many people, however, find it more motivating to do one or two activities every hour or two, so that it doesn’t feel like an additional obligation. Just be sure to perform each activity at least once per day. To get started using the spread-out plan, do one or two of the activities mid-morning, and more mid-afternoon. Progress to doing one or two of the target activities with a few reps, each hour or so. Initially, your brain will have to remind your body to do the stretches. You may have to set the timer on your phone. Over time you should experience a “biofeedback”-like effect from the stretches. Your body will start reminding your brain you need to stretch! Feel free to listen to your body, and stretch any time of the day or night. Thanks so much for sharing your expertise regarding the health benefits of stretching. Your instructions and photos are easy to understand. Pinning this to my health board. I'll be implementing these starting today! I think this is a good article. I worked in an office for years and stretching like this provides many benefits. I did some of these and they do relieve stress and make you feel better. This is an useful hub for everyone who could stretch from their own desk, whether at work or at home. Thanks for sharing those stretches that anyone can do. I tried out some of these and they feel absolutely fantastic after a day of siting. Thanks for sharing! So useful–thanks much for sharing your expertise.